The momonga or Japanese flying squirrel, Pteromys momonga: less than a foot in length and possibly the most revoltingly adorable animal in existence. Photo from here. The Sciuridae are a family of about 280 species of rodent native to all continents except Australia (where they are currently represented only by a population of the Indian palm squirrel Funambulus pennanti living in and around Perth Zoo that was first established in 1898). The family is primarily arboreal though some lineages in the subfamily Xerinae have become terrestrial. According to the classification adopted by Thorington & Hoffmann (2005), living squirels are divided between five subfamilies. There are also two currently standing fossil subfamilies that have been recognised in the Sciuridae. The Cedromurinae (a name that can be translated as "cedar-mice") are a small group from the Oligocene of the North American Great Plains (Korth & Emry 1991). Cedar-mice lack certain features of the dentition of living squirrels, placing them outside the sciurid crown group. Most notable of these is the lack of sciuromorphy, a derived mode of attachment of the jaw muscles. The muscle attachment sites for cedar-mice do not extend as far forward on the skull as in crown squirrels. Sciuromorphous squirrels are known from even earlier in the fossil record than cedar-mice and the two groups would have been contemporary. 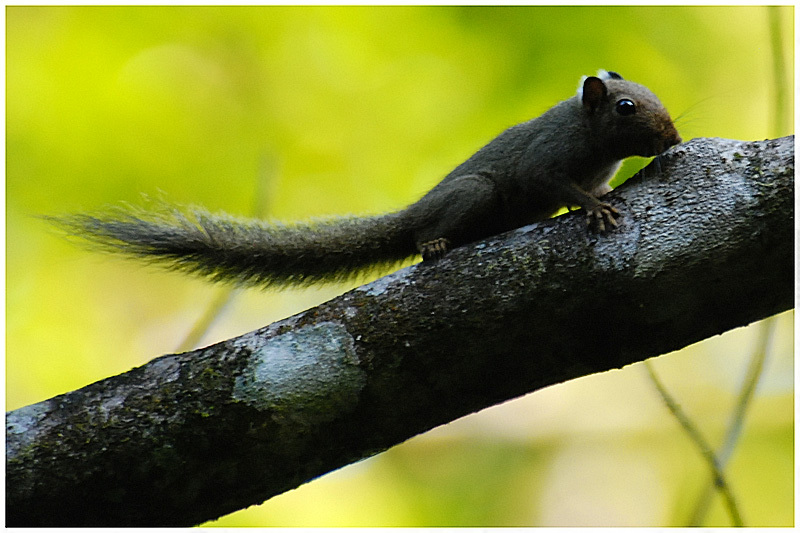 The neotropical pygmy squirrel Sciurillus pusillus, a phylogenetically isolated squirrel species found in Amazonian South America. Photo from here. Also quite distinct in its dentition was the Chinese Pleistocene Aepyosciurus orientalis, placed in its own subfamily when originally described (Wang & Qiu 2003) though this probably needs further investigation*. Aepyosciurus had the highest tooth-crowns of any squirrel, probably an adaptation to living on a much tougher diet on the arid Tibetan plateau. *Chinese vertebrate palaeontology seems to be awash with monotypic suprageneric taxa established for 'distinctive' species without any attempt to actually place the species phylogenetically. Many of these are later sunk into previously established, more inclusive groups (such as happened with Yuesthonyx). Explanatory factors for this situation probably include lack of communication between Chinese and foreign researchers and/or lack of opportunities to study non-Chinese specimens and publications, and a perceived link between personal prestige and the numbers and significance of taxa described. 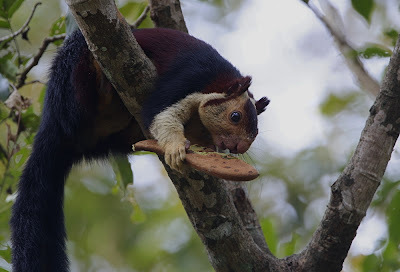 Indian giant squirrel, Ratufa indica. Including the tail, giant squirrels can reach close to a metre in length. Photo by Rajiv Lather. The known distributions of the cedar-mice and many of the earliest squirrels indicates a North American origin for the Sciuridae. However, squirrels invaded Eurasia early in their history with numerous subsequent migrations back to North America; probably the great majority of living American squirrels are descended from Eurasian ancestors (Mercer & Roth 2003). Perhaps the only living squirrel that might have a claim to a lineage untainted by Eurasian influence is the South American Sciurillus pusillus which may be the sister group to all other living squirrels. Also very basal are the Ratufa giant squirrels of southern Asia. The remaining squirrels form a clade divided between the Callosciurinae (the Asian palm squirrels), Sciurinae (including the 'typical' and flying squirrels) and Xerinae (African squirrels, chipmunks and ground squirrels). Korth, W. W., & R. J. Emry. 1991. The skull of Cedromus and a review of the Cedromurinae (Rodentia, Sciuridae). Journal of Paleontology 65 (6): 984-994. Mercer, J. M., & V. L. Roth. 2003. The effects of Cenozoic global change on squirrel phylogeny. Science 299: 1568-1572. Thorington, R. W., Jr & R. S. Hoffmann. 2005. Family Sciuridae. In: Wilson, D. E., & D. M. Reeder (eds). Mammal Species of the World: A Taxonomic and Geographic Reference 3rd ed., vol. 2 pp. 754-818. John Hopkins University Press: Baltimore. "Perhaps the only living squirrel that might have a claim to a lineage untainted by Eurasian influence is the South American Sciurillus pusillus which may be the sister group to all other living squirrels. Also very basal are the Ratufa giant squirrels of southern Asia." The phylogenetic isolation of Sciurillus was not supported by Steppan et al. (2004); they found Sciurillus and Ratufa to be (admittedly very anciently diverged) sister taxa, which together form the most basal sciurid lineage. Regarding the sciurids' evolutionary centre of origin Steppan et al. were noncommittal and said that it need not necessarily have been in North America. Steppan, S.J., Storz, B.L. & Hoffmann, R.S. 2004. Nuclear DNA phylogeny of the squirrels (Mammalia: Rodentia) and the evolution of arboreality from c-myc and RAG1. Molecular Phylogenetics and Evolution 30, 703-719. ...and yeah, those flying squirrels really are unacceptably cute. Oh, good god. Those Japanese flying squirrels. They're living cartoons. Dartian: Steppan et al. are referring to the geographical origin of the squirrel crown group as opposed to the total group. The latter is more firmly North American though there are some Eurasian fossil species that may possibly be stem-group sciurids. It is worth noting that while the sister taxon of sciurids, the Aplodontidae, is currently restricted to North America, it was previously also found in Eurasia. Snail: Yes - and they come from Japan. Could it be any more apt? "Steppan et al. are referring to the geographical origin of the squirrel crown group as opposed to the total group"
Yes, but isn't that distinction a rather moot point in this context? I mean, are there any currently known (extinct or extant) sciurids that do not nest within crown-group Sciuridae? Have any modern phylogenetic studies identified fossil taxa that belong to stem-group Sciuridae? "there are some Eurasian fossil species that may possibly be stem-group sciurids"
The earliest putative sciurids from the New World and the Old World, respectively, seem to be the late Eocene Hesperopetes (Emry & Korth, 2007) from Wyoming, and the Oligocene Kherem* (Minjin, 2004) from Mongolia. In other words, the temporal gap between the earliest known occurrence of sciurids in North America and their earliest known occurrence in Eurasia is relatively short. * Nomenclatural trivia of the day: 'kherem' is the Mongolian word for 'squirrel'. Emry, R.J. & Korth, W.W. 2007. A new genus of squirrel (Rodentia, Sciuridae) from the Mid-Cenozoic of North America. Journal of Vertebrate Paleontology 27, 693-698. Minjin, B. 2004. An Oligocene sciurid from the Hsanda Gol Formation, Mongolia. Journal of Vertebrate Paleontology 24, 753-756. 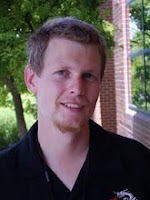 Forgot to add: Neither Emry & Korth (2007) nor Minjin (2004) performed any cladistic analyses to establish the evolutionary affinities of Hesperopetes and Kherem, respectively, with extant squirrels. To the best of my knowledge, nobody has yet done a proper, large-scale study of fossil sciurid phylogenetics. Those momonga just killed me with cute. As noted in the post, it would be very surprising if the Cedromurinae were not stem sciurids because of their lack of sciuromorphy. The North American Douglassciurus from about the same time period is also not sciuromorphous. The proposal of their relationships in Korth & Emry (1991) is, however, comparatively based only. To date, there has been no numerical phylogenetic analysis of fossil sciurids. 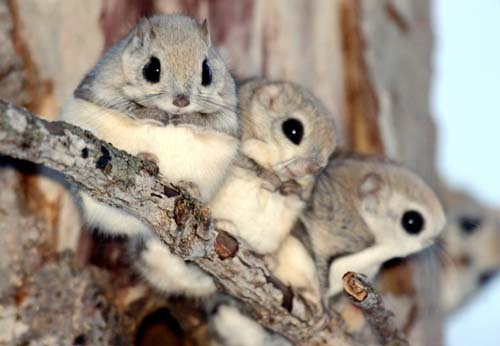 Southern Chinese flying squirrels are the source of a highly regarded painkiller in traditional Chinese medicine. The part used is the dung. 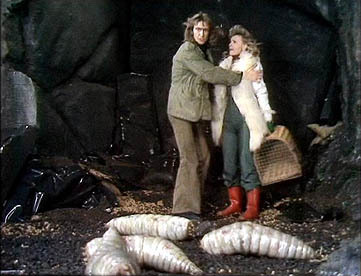 "As noted in the post, it would be very surprising if the Cedromurinae were not stem sciurids because of their lack of sciuromorphy." Hmm, right, I somehow managed to overlook that sentence. Sorry; my reading comprehension skills may have been dulled from watching too much football (OK, OK, 'soccer') lately. Regarding flying squirrels; it's interesting that both Mercer & Roth and Steppan et al. found flying squirrels to nest well within 'regular' squirrels in their sciurid trees. Traditionally, flying squirrels have usually been considered to be the sister taxon of all other sciurids (to the point of deserving family-level distinction), and it's rather surprising to find molecular data suggesting that flying squirrels are actually regular squirrels too. 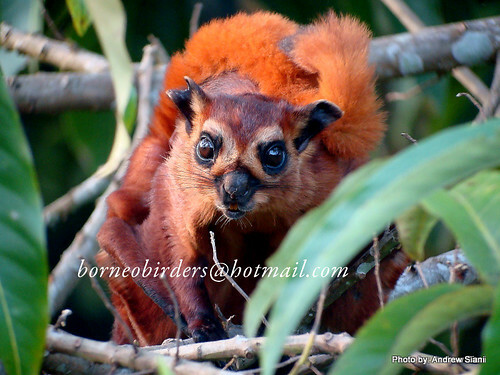 Finally, here's some antidote to all those who are about to swoon over pictures of cutesy-wutesy flying squirrels: behold, their bigger and meaner cousin, the red giant flying squirrel Petaurista petaurista (notice especially the battle-scarred ear).